I am asked to do many different commissions. Letters are designed or adapted for each piece of work and tools and materials chosen to best suit the finish that is required. Holy Trinity Church Clapham commissioned me to paint their reredos screen. Although records are unclear, it is likely that the original 1776 building had gilded inscriptions of the Ten Commandments, the Lord's Prayer and the Creed on black panels above and behind the alter. In 1903, the church was extended and the panels placed on the reredos were of plain wood covered in cloth. My job was to paint new inscriptions onto the panels. Click on the image for a slideshow of the process, from initial design and layout to finished work. 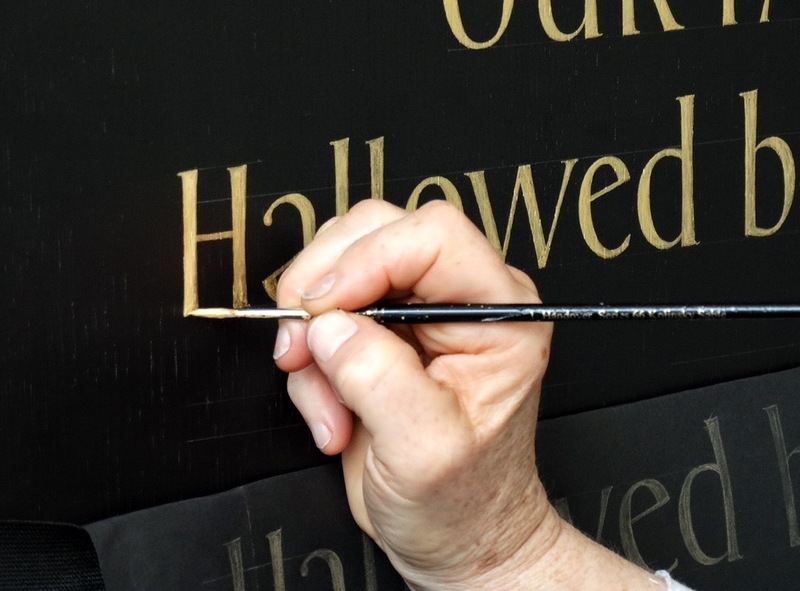 In recent years I have been asked to do several site-specific works for Anglican and Methodist churches in London, Sussex, Cambridge and Bury St Edmunds. Here are a few of the most recent commissions. Painted panel in the foyer of Clapham Methodist church. Psalm on the wall of the prayer chapel at Chelsea Methodist Church. Design for a window of St James' church Cambridge, cut out of film and applied to appear as if it is etched. Painted wall in the entrance to Trinity Methodist Church, Bury St Edmunds. These are one-off pieces of work for clients who ask me to present words and information for a variety of purposes. Covers for a book collection, made from handmade Indian rag paper and titles written in black ink. Family tree, written with quills on vellum. Scroll case made to house the skin of vellum. Small handmade book in a box. A poem is painted on the pages of the book as was commissioned for a wedding anniversary gift.